How would you describe this year’s Peace Week events? Make your choices. Pledge to grow your vision of peace. Whereas, it is important for Delawareans to be involved in activities that will support a peaceful Delaware. Eighty-five events have been registered, seventy-five in New Castle County, six in Kent County and four in Sussex County for Peace Week Delaware 2018. They include community picnics, community walkabouts, interfaith conversations, discussions on racial divisions, alternative to violence workshops, lectures and discussions on immigration issues, healthy practices from yoga to meditation, films, religious services, dramatizations on topics like homelessness and peace vigils, drum circles, several collections for the needy, consciousness raising for LGBTQ populations, a radio program, a community wellness fair and youth activities ranging from taking video to painting and writing poetry to making crafts like pinwheels and origami. Thanks to the creativity and unselfishness of Peace Week event sponsors, we will all have a diverse program of events to educate, inspire, motivate and amuse us beginning on September 15. Thank you, event sponsors, for your efforts in designing these events and for your future efforts in executing them for our collective benefit. For those of you who did not make the deadline, we encourage you to register your events so that they can be included on our website. Your events will still qualify as full-fledged Peace Week Delaware events; we will all work to make every event a success. All events have been posted. Event sponsors, please check the postings for your event and contact us as soon as possible at events@peaceweekdelaware.org if editorial changes are needed. Events registered after July 1 cannot be included in our printed program. We will be pleased to post events registered after July 1 on our website but we will not be able to publish your event in our printed program if it is submitted after July 1. Register your event by clicking here for our Event Registration Form. Yom Kippur, the holiest day in Judaism, begins before sunset on September 18th and ends after nightfall on the 19th. We are tentatively planning a gala Peace Week opening event on Saturday, September 15 from 7:00-10:00. Stay tuned for more information. Is your organization thinking about repeating a successful Peace Week event or planning something new? The Peace Week Steering Committee has developed guidelines for events and stands ready to help you. We can also connect you to other like-minded organizations. If you pool your resources, you’ll reach a larger audience and have a greater impact. If you’re new to Peace Week Delaware, be sure to check out our event criteria. Event registration is now open. It will close on July 1, Events registered after July 1 cannot be included in our program. Click here for our Event Registration Form. The Steering Committee is excited about how the plans for Peace Week Delaware 2018 are coming together. It’s time to meet again, to expand the individuals and groups involved, and to develop plans for specific events.Remember that event submissions will close on July 1. Parking is available on the street or use the office lot across the street. Remember that we depend on people from the community to design and sponsor events. We can help you find a venue, locate a speaker, publicize your event and enlist support. Join us. Let us work together to make a difference in our community. The third annual Peace Week Delaware will be held from Sept. 15 – 23, 2018. The event has been expanded to nine days — including two full weekends — because of the large number of events expected. In 2017, sixty events were held across the state. Peace Week will again be held in conjunction with International Peace Day, which is Friday, Sept. 21. The Steering Committee for Peace Week has already begun meeting. It’s looking for new volunteers to manage a variety of tasks. If you’re interested in helping to organize the overall Peace Week Delaware effort, email volunteer@peaceweekdelaware.org. Meetings in Wilmington are held bi-weekly at St. Stephen’s Lutheran Church on Broom St. Additional committees will be forming in Kent and Sussex counties this spring. Is your organization thinking about repeating a successful Peace Week event or planning something new? The Peace Week Steering Committee has developed guidelines for events and stands ready to help you. We can also connect you to other like-minded organizations. If you pool your resources, you’ll reach a larger audience and have a greater impact. If you’re new to Peace Week Delaware, be sure to check out our event criteria. Event registration will open in the spring and will close a little earlier this year so we can produce our popular program guide. Dates will be forthcoming soon, so follow Peace Week news by entering your email address in the left-hand column of the home page and clicking SUBSCRIBE. You’ll receive a notification when we post new information here. Peace Week Delaware 2017 was a huge success. Based on sponsor reports and our own estimates, we can say with confidence that attendance at Peace Week Delaware events totaled about 3,500. That’s a 75 percent increase in attendance over 2016. The number of events offered under the Peace Week banner increased by 50 percent—from 40 to 60. But it is the quality and thoughtfulness that went into event planning that impressed us most. Some events were repeated from last year, but many new ideas emerged. There were concerts, speakers, films, marches, exhibits, workshops, and talks. We talked about building community in our neighborhoods, city, and state. We learned about refugees and human rights from a global perspective. We addressed racism and white supremacy. We sought greater understanding of the lives of immigrants and the homeless among us. We explored ways to prevent our youth from being caught up in gun violence. We had pizza and conversation with the Wilmington Police Department, including its new chief. Eleven public libraries mounted events and displays. Hundreds of artworks envisioning peace were hung at the Delaware Contemporary—and will tour the state for the next year. Several very timely events promoted dialogue with Muslims—and an opportunity to attend Friday prayers at a local mosque and two shared meals. We heard the poetry of Rumi, the spoken word of our Twin Poets, and the rap of El Rod. We had interfaith and cross-cultural conversations. We saw “Out of the Ashes”—a father and son reuniting after a long incarceration. We promoted health in the community and safety for our children. We heard about mindfulness in the face of trauma and violence. We meditated and walked the labyrinth, seeking peace within. We marched in Wilmington’s West Side and in the center of Lewes. We gathered for a Day of Peace in Rodney Square, celebrating the arts. This was Peace Week Delaware 2017. It was supported by our Community Partners and the generosity of individuals. Hundreds of volunteers created events. Thousands attended. 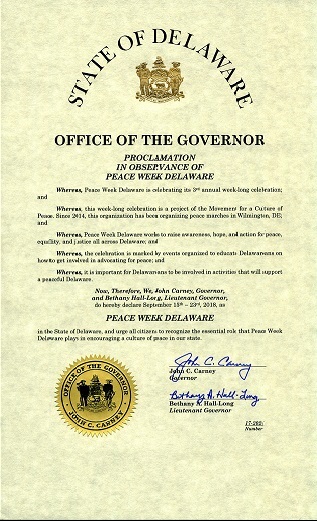 We thank everyone—especially those of you who attended and connected with each other through Peace Week Delaware.